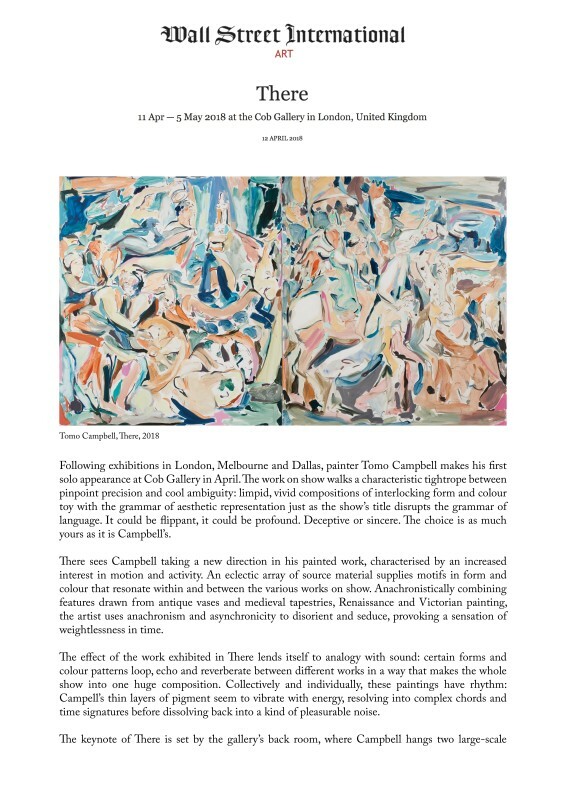 Following exhibitions in London, Melbourne and Dallas, painter Tomo Campbell makes his first solo appearance at Cob Gallery in April. The work on show walks a characteristic tightrope between pinpoint precision and cool ambiguity: limpid, vivid compositions of interlocking form and colour toy with the grammar of aesthetic representation just as the show's title disrupts the grammar of language. It could be flippant, it could be profound. Deceptive or sincere. The choice is as much yours as it is Campbell's. There sees Campbell taking a new direction in his painted work, characterised by an increased interest in motion and activity. An eclectic array of source material supplies motifs in form and colour that resonate within and between the various works on show. Anachronistically combining features drawn from antique vases and medieval tapestries, Renaissance and Victorian painting, the artist uses anachronism and asynchronicity to disorient and seduce, provoking a sensation of weightlessness in time.